HawthoRNe, Jada Pinkett Smith's show cancelled after three seasons. Home Entertainment HawthoRNe, Jada Pinkett Smith’s show cancelled after three seasons. HawthoRNe, Jada Pinkett Smith’s show cancelled after three seasons. “Will Smith caught Jada and Marc Anthony in his own home” In Touch said. Will Smith says his marriage is “intact”. Jada Pinkett denies affair with Marc Anthony. Only one week after weathering rumors of an infidelity with Marc Anthony, Jada Pinkett Smith has suffered another blow. TNT confirmed on Friday that medical drama HawthoRNe, in which Jada Pinkett Smith starred alongside Marc Anthony, has been cancelled. HawthoRNe ran for three seasons, premiereing on U.S. channel TNT back in 2009. In the last season, Jada Pinkett Smith’s character, Christina Hawthorne, shared steamy scenes with Marc Anthony’s Detective, Nick Renata. There were reports claiming that Jada Pinkett Smith, Will Smith’s wife, had shared an off-screen fling with Jennifer Lopez’s now estranged husband, Marc Anthony. All parties, including Will Smith, have strenuously denied the claims. Writing on social networking site Twitter, Jada Pinkett Smith thanked her fans on Friday for their loyal support. 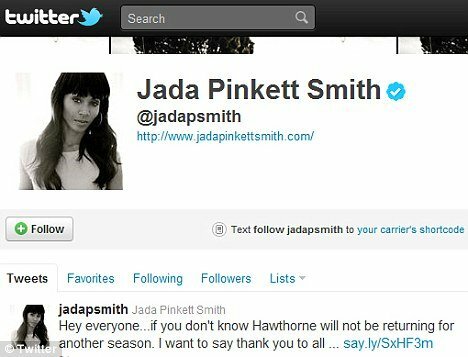 Jada wrote: “Hey everyone…if you don’t know Hawthorne will not be returning for another season. “TNT has decided not to order a fourth season of HawthoRNe. “TNT truly appreciates the tremendous dedication of everyone involved in HawthoRNe. “The series gave TNT the opportunity to work with many outstanding people, including Jada Pinkett Smith and the rest of the show’s talented cast, crew, producers and writers. Gerard Depardieu remakes "oui" airplane role.